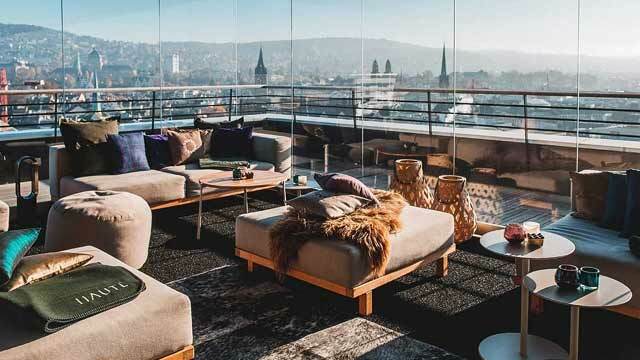 A complete guide to the 6 fantastic rooftop bars in Zurich in 2019. Here you'll find all the best Zurich rooftop bars with,complete with all info. Opening hours, dress code, pictures, maps and much more for every roof terrace. 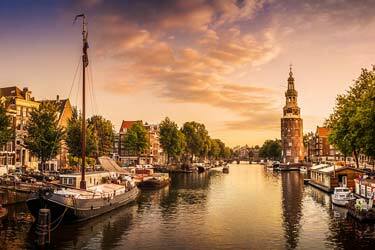 One of the most harmonious big cities in the world. Mostly because its remote and beautiful location, surrounded by the mountains and lakes. 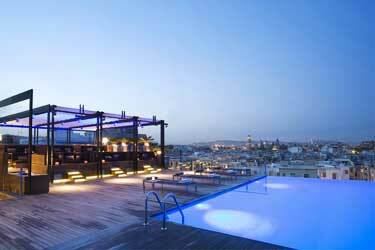 The terraces here can boost of with spectacular views and some awesome restaurants and bars. 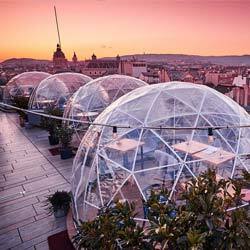 So, which is the best rooftop bar in Zurich? 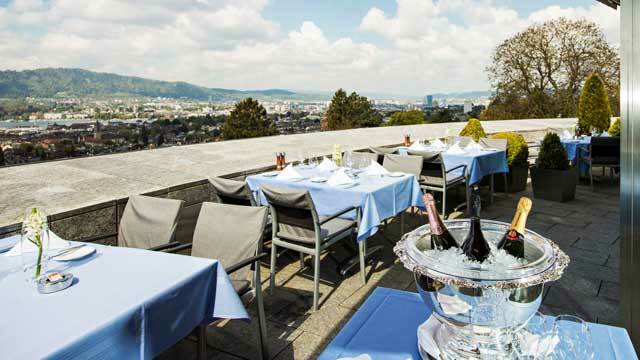 Just scroll down and find the Zurich rooftop bar best suited for you. Or use the Zurich rooftop map in the bottom right corner. 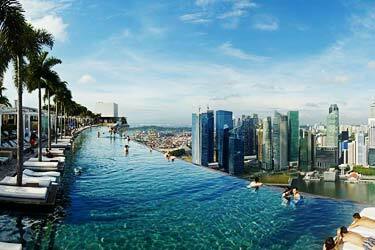 SKY BAR and the hotel Eden Au Lac is closed for renovation, will re-open during 2019. Located right by the water, which gives this terrace a magical view. Perfect rooftop bar in Zurich to take an after-work. Good drink menu, good food and fast service. This awesome rooftop bar and restaurant is located on the top two floors of the Hochhaus zur Schanze building, right in the heart of Zurich. Exclusive spot and a club members’ restaurant and bar, so if you are not a member, make sure to call ahead and see if you can book a table. 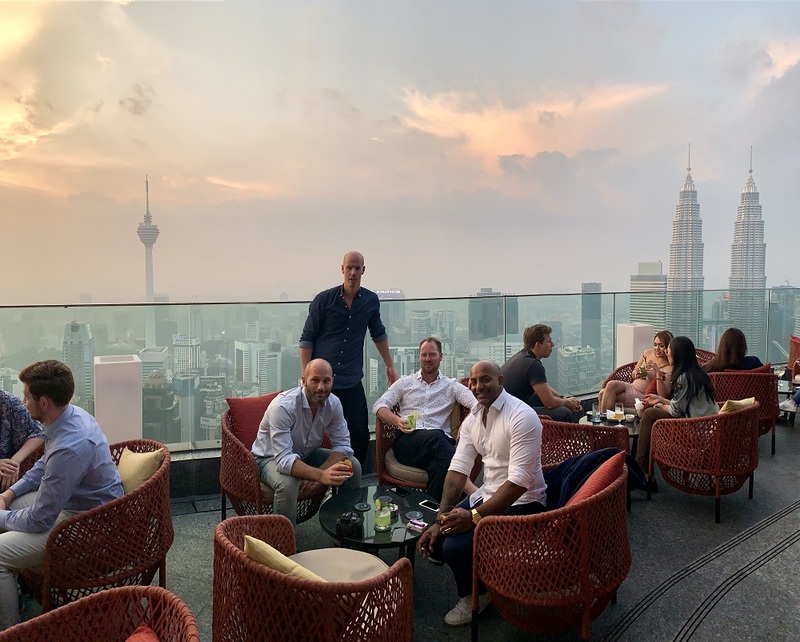 Enjoy premium drinks, gourmet food and panoramic views stretching over the city and Lake Zurich, both at the 'downstairs' indoor lounge and al-fresco rooftop terrace, and the top floor stylish restaurant. Hiltl is actually the world's oldest vegetarian restaurant, and can be found at various locations around Zurich. 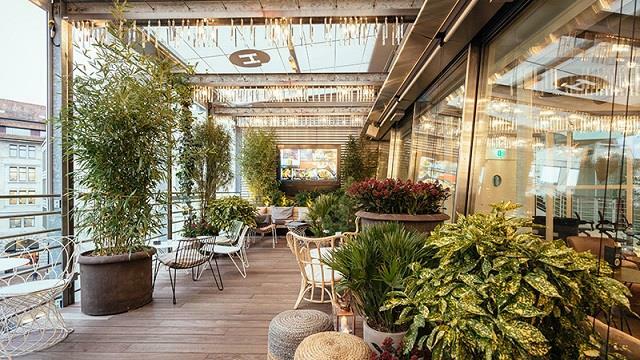 Since 2015 also above the PKZ Women in the city center, where the cosy and charming Hiltl Dachterrasse offer not one, but two lovely rooftop terraces. 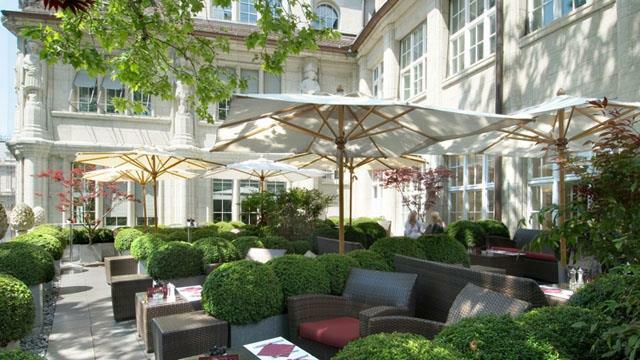 Modern, green and lush, the roof gardens gives you a beautiful view over the busy Bahnhofstrasse. Enjoy great vegetarian food, fine coffee and tea specialties along with a large selection of fresh and tasty cocktails. A luscious and green rooftop bar and lounge in Zurich, situated on the roof of Grieder shopping malls, right in the heart of the city. 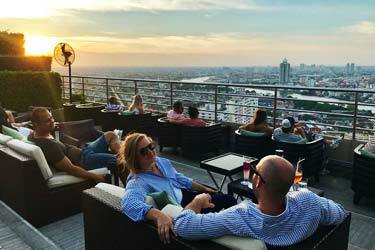 The terrace is equipped with classic and comfy lounge couches and white parasols, and up here you get an awesome view over the Paradeplatzof and the city rooftops. Open during retail hours, so mainly a spot perfect to enjoy homemade dishes during a sunny lunch, or a relaxing glass of champagne in between all the shopping. 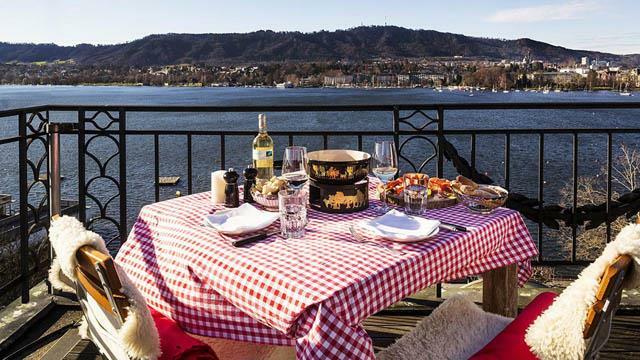 Located at Sorell Hotel Rigiblick, a bit outside and above the city center of Zurich, Rigiblick Terrace offers a quite magical view of the Zurich skyline, the lake and the alps. The 2nd floor do feel a lot higher up here! Belonging to the fine-dining Restaurant Rigiblick and Bistro, here you can enjoy fantastic seasonal, local and sustainable creations ina a very pleasant and relaxing in atmosphere. Great for a sunny lunch, but probably even better for a hard-to-forget sunset dinner. 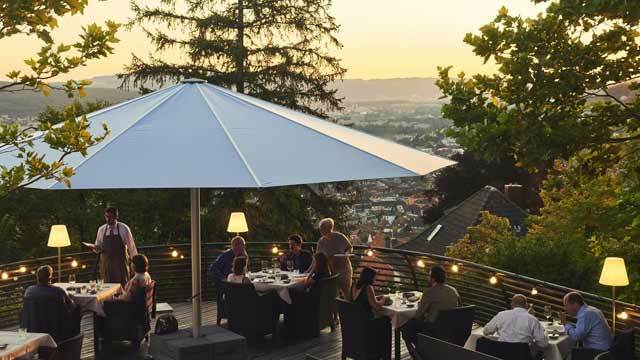 On the hills outside of Zurich you find Sonnenberg, an amazing fine-dining restauarant and rooftop bar with one of the best views in all of Zurich. And happily enough, the food has the same quality as the view. Enjoy modern, exalted brasserie-dishes with influences from both Switzerland and all of Europe, complemented with an extensive wine list. Year round restaurant inside, during the warmer months the second floor terrace opens up for food and views al-fresco style. Discover the biggest collection of Zurich activities, guided tours and skip-the-line tickets. Anything you want you'll find right here. Which are the best rooftops in Zurich? This complete guide will help you find the best rooftop bars in Zurich. The climate here is temperate which results in that the rooftop bars in Zurich being closed during the winter. 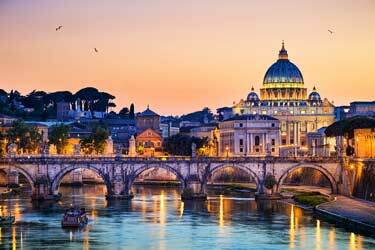 But the warmer months can give quite magical days and nights at any of the rooftops available. Zürich is Switzerland's largest city. The city is beautifully situated right on Lake Zurich, surrounded by forested mountains. 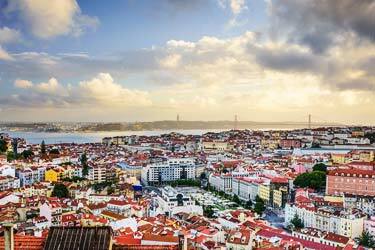 This offers an enchanting view over the entire area. 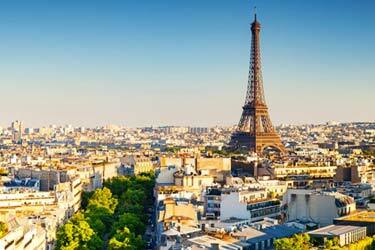 Attractions in the city are museums, the old town, cathedrals and the zoo. Zürich abounds with good restaurants, where you primarily eat fondues, rösti or other Swiss specialty's.